A recent report has shown that home health agencies are outperforming their post-acute counterparts as a whole in terms of rehospitalization rates. Data released last Wednesday by the Alliance for Home Health Quality and Innovation shows that home health agencies have markedly improved patient outcomes and rehospitalizations when compared to other post-acute methodologies in the same demographic categories. It could be suggested that the numbers not only represent an increase in the quality of care, but also that home health policies and procedures are putting great care into protecting their reputations for the sake of protecting their referral streams from hospitals. Since 2012, hospitals have been subject to reimbursement cuts if the ratio of patients returning within 30 days of their initial visit becomes too unfavorable. Due to this policy, hospitals would obviously rather send referrals to post-acute providers with proven low-readmission track records. 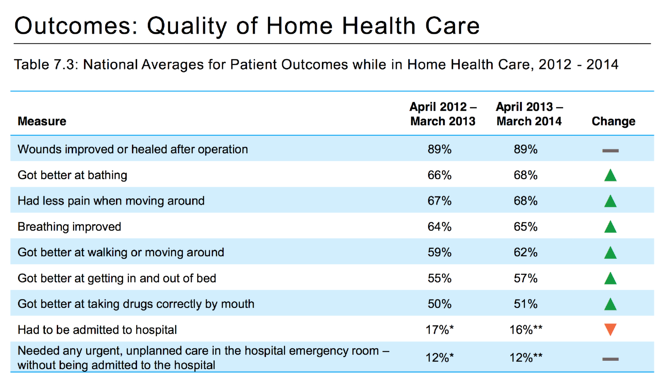 According to the report, 2011-1012 readmissions from home health providers decreased by around 2% from 19.2% to 17.4%. 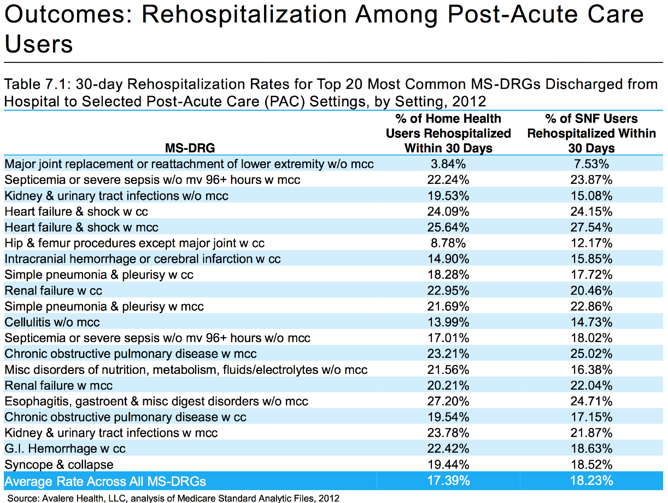 The overall readmissions rate within 30 days of discharge for all post-acute sectors in 2012 was at 18.4%. Best-practices training and patient checklists for actions such as medication teaching and diabetic care have become more prevalent in home health settings and certainly have contributed to better outcomes rates overall. Additionally, Medicare incentives have also contributed to better overall rehospitalization rates. In addition to rising performance marks, home health care has provided lower-cost care options versus facility-based care. This has made home health agency referrals a particularly attractive option for hospital discharge planners. ACOs (accountable care organizations are also given incentives for providing lower cost and higher care quality options for discharged patients, and ACOs have become increasingly prevalent over the past year as some recent reports have shows. The amount of hospital-to-homecare discharge plans is expected to rise over the coming years as it has proven itself to be a high quality and cost-effective option that also provides a greater level of comfort to the patient.